Posted on Tuesday, May 17th, 2016 at 11:04 pm. You may wonder what is the difference between a comprehensive eye exam and an exam for prescription eyeglasses? When I go to get a prescription for new eyeglasses did I have a comprehensive eye examination? 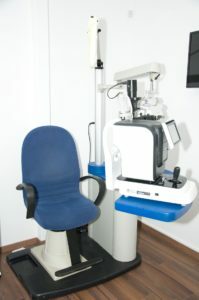 A full eye examination starts with the doctor checking your vision. Then, the doctor will perform a refraction. This is when the eye doctor tries to see how good you can see with eyeglasses. The eye doctor wants to know how good you can see with a pair of eyeglasses. An eyeglasses examination may often end now. A comprehensive eye examination includes many other aspects to check the health of your eyes. Diseases of the eye such as glaucoma, cataracts and macular degeneration (ARMD) will not be detected on a glasses examination. A comprehensive eye examination includes a eye pressure check to assess for glaucoma, a slit lamp examination as well as dilation of the pupils. Dilating the pupils allows the doctor to again check for glaucoma, to check for cataracts, macular degeneration (ARMD) as well as many other diseases of the eye. Many cases of glaucoma can be missed if the pupils are not dilated. An eye examination can take an hour or more. It is especially important to have a dilated eye examination if you have diabetes or a family history of eye diseases. Many causes of preventable blindness have no symptoms, especially at the early stages. Depending on your age, recommendations for complete eye examinations vary, but many of our patients are seen on an annual basis. We all want to see for the rest of our life! A board certified ophthalmologist will typically perform a comprehensive eye examination to make sure your eyes are healthy. If any diseases of the eye are suspected, they may decide that further in depth testing is indicated. This testing can help the doctor determine the severity of the disease and if any treatments are indicated. The doctor will let you know how often follow up evaluations are indicated.